How to Make a Milk Pai Dates Cake Delicious and Savory .Cakes palm fruit pie is one of the pastries often serve during the holidays of Christmas. This cake has a delicious flavor and savory. fair if the palm fruit pie is widely popular in all circles both old and young, and children - children. 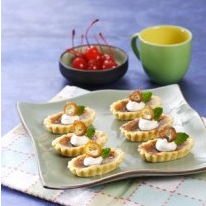 To get a pie dish of dates, you can get in a nearby pastry shops in your area. Well, for those of you who want to make a pie milk that feels special date, please try the recipe how to make a pie of dates below. To make the skin, put powdered sugar, margarine, egg yolks, salt, ice water and flour. After the stir, and if the skin until all ingredients are well blended. Then knead the dough Coagulate skin and then put in the refrigerator for about 15 minutes until cool. Prepare pie prints of small oval and serrated. Spoon the batter into the prints of the skin and the shape becomes flat. If so, enter it into the prints of the oven. Bake until half cooked. To make the contents, fill half the milk together dates into blender container. Then blend up to two ingredients are smooth. Enter blenderan dates, vanilla paste, cinnamon powder, eggs, sugar, the remaining milk, salt and cornstarch into another container. Stir all ingredients until well blended. Next enter the cake batter on the skin. Then insert it into the oven and setting the temperature should not exceed 150 and bake until done. Let stand until the pie is not hot. Finally, use whipped cream to garnish the top of the cake by way of dousing. 0 Komentar Untuk "How to Make a Milk Pai Dates Cake Delicious and Savory"